The following text by William Pierce is the last part of a longer text, “Background to Treason: A Brief History of U.S. Policy in the Middle East, Part 2: From the Balfour Declaration to the Roosevelt Era .” The subtitle is my own creation. [A]s the 1920s dawned, everything seemed rosy for the Jews. At the same time that Jewish immigrants were pouring into Palestine to begin building a new world Jewish headquarters there, they were consolidating their grip on the two largest White nations in the world, the United States and Russia. In the next decade those forebodings were realized, as Stalin launched a massive purge of the Bolshevik power structure, sending whole armies of Jewish commissars to their deaths in prison cellars and slave-labor camps. The fact that many of the prison wardens and camp commissars in the 1930s were still Jewish was only a slight comfort, because a new generation of Gentile commissars was clearly on the rise, and the days of Jewish power in the Soviet Union were numbered. Growing Jewish power in the United States also brought a reaction in the 1920s which made many Jews uneasy. Automaker Henry Ford was not the only influential Gentile who was busily alerting his fellow Americans to the Jewish danger. The major book-publishing firms, unlike the newspapers, were still free of Jewish control, and dozens of writers were producing books, for popular and semi-popular readerships, which attempted to awaken a sense of racial consciousness and racial solidarity among the White masses and the White leadership elite alike. Another development during the 1920s which helped to turn the thinking of Zionist leaders toward the benefits which Jews might be able to reap from another major war among the goyim was the rise of Revisionism. In April 1925 Vladimir Jabotinsky (1880-1940), a Soviet Zionist, founded the Revisionist Party. His aim was to persuade his fellow Jews to break with the policies of gradualism and compromise to which he felt the Zionist establishment had succumbed and which had led to stagnation in the takeover of Palestine; he wanted a return to the militant, uncompromising, political Zionism of Herzl. Jabotinsky was furious with those Jews who were so concerned with world opinion that they paid lip service to the statements in the Balfour Declaration and in the subsequent League of Nations Mandate for Palestine which called for the protection of the rights of the Palestinian people. Had not the Jews’ god told them that the earth and all in it were created solely for the sake of the Jewish people? Had not he ordered them to exterminate without mercy everyone who stood between them and their rightful dominion over the earth? Why, then, should they not arm themselves and begin killing Palestinians immediately? That was the way to solve the Arab problem! From 1933 on, however, it was the establishment Zionists much more than the Revisionists who led the campaign for a new world war. 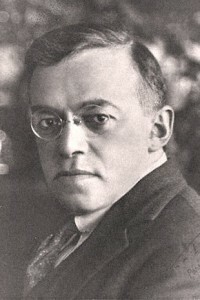 Even without any prompting from Jabotinsky they were thoroughly frightened of what was taking place in Europe, especially in Germany, where Adolf Hitler, their sworn enemy, had become chancellor on January 30, 1933. David Sarnoff, a Jewish immigrant from Russia, had become president of the Radio Corporation of America in January 1930. He was also chairman of the board of directors of its subsidiary, the National Broadcasting Company. Another Jew, William S. Paley, had been the president of the competing Columbia Broadcasting System since 1928. And just a few weeks after Roosevelt was inaugurated, Bernard Baruch’s old partner on the War Industries Board, Eugene Meyer (who was also appointed head of the War Finance Corporation by President Wilson), purchased the Washington Post at a bankruptcy auction in the District of Columbia for a trifling $825,000. Another aspect of the Jews’ xenophobic attitude, which is held even by non-religious Jews, is a uniquely intense preoccupation with alleged past injuries done them by other peoples: Egyptians, Philistines, Persians, Romans . . . ; it is a very long list. Many other peoples nurse historic grievances — Armenians and Greeks against Turks, Blacks against Arabs and Whites, Koreans against Japanese, Irishmen against Englishmen, Southerners against Yankees — but only the Jews cherish their “persecution” to such an extent that it has been elevated to one of the determining features of their world view. They virtually define themselves in terms of their enemies, past and present. What would the Jews be today if they did not have the “Holocaust” of a generation ago to wail about? One can hardly imagine it. 1. Henry Ford spent millions of dollars during the First World War in a vain effort to keep America from becoming involved. During this effort he became aware of the Jews’ role in fomenting the war. After it was over he purchased a newspaper, theDearborn Independent, and over the next few years published hundreds of documented articles exposing the Jews’ destructive activities. Many of these articles were later reprinted in four bound volumes titled The International Jew, which were widely distributed during the 1920s. 3. In his personal political testament Adolf Hitler described his decision to devote his life to the fight to liberate his people from the Jews and Jewish influences. The decision was made in November 1918, when Hitler was lying in a German military hospital, blinded by a British poison-gas attack. There the 29-year-old corporal, who had spent four years fighting in the trenches and had received Germany’s highest decoration for bravery, heard of the mutinies and strikes organized throughout Germany by the Bolsheviks, crippling the German government and paralyzing the war effort. 4. See “What Is a Jew,” National Vanguard, no. 90, pp. 3-7.